Help Provide a Happy Holiday for Kids with Disabilities! 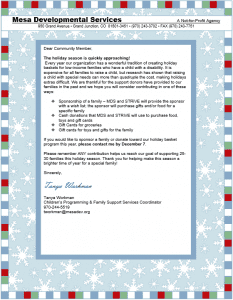 The Holiday Season is Quickly Approaching and STRiVE needs help to provide holiday baskets for families who have children with disabilities! You’ve probably heard the saying, “It takes a village”, but for families with children who have disabilities the saying couldn’t be truer. We all know children are expensive, but did you know research shows raising a child with special needs can more than quadruple the cost! Can you imagine trying to make the holidays special for your child if you earned three times less than you currently do? 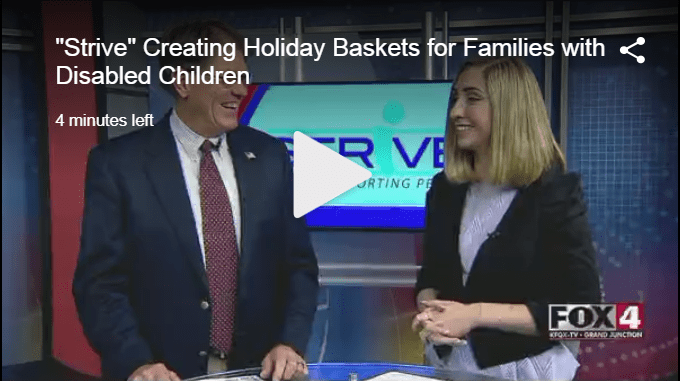 Because the holidays can be extra difficult, here at STRiVE, we have a wonderful tradition of creating holiday baskets for low-income families who have a child with a disability. STRiVE, has been serving Mesa County residents for over 50 years with a variety of services that help families and support individuals with developmental disabilities, STRiVE is a partnership of people supporting people. We are an organization that continually sees the needs in the community and strives to make a difference in those areas. We are so thankful for community members just like YOU, that donate to provide our families with a special holiday! With our goal of supporting 25-30 families this holiday season, we want to thank you in advance for helping make this season a brighter time of year for a special family! If you would like to sponsor a family or donate toward our holiday basket program this year, please contact Tanya Workman by December 7th! STRiVE is a private, non-profit organization authorized by the State of Colorado to provide community-based services and supports to individuals with disabilities and their families. STRiVE has been providing services and support to individuals and families with developmental disabilities in Mesa County for over 50 years. As the community needs have increased so has the diversity of our programs. “STRiVE” represents our staff and the people we support every day. STRiVE offers a coordinated spectrum of care and support services that range from minimal to around-the-clock assistance for people with all levels of intellectual, physical and mental challenges. STRiVE’s mission is support people who strive to meet their full potential. STRiVE is a partnership of people supporting people. GRAND JUNCTION, Co. - Raising children can come with quite the cost, but research has shown that raising a special needs child can more than quadruple that cost. Each year, Strive aims to assist families in that situation by providing them with basic necessities. Doug Sorter, Vice President of Strive, stopped by the Fox 4 studio to talk about this annual donation of holiday baskets. Strive is asking community members to sponsor a family, or to simply donate towards the organization, in order to assist low-income families who have children with disabilities. For more information on the program, or to make a donation, you can visit their website, or call Doug Sorter at (970) 250-1595.